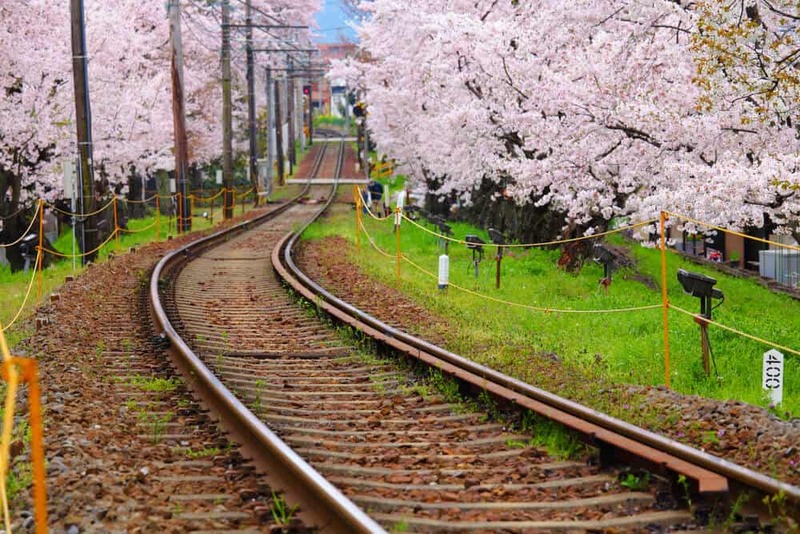 Japan takes its enthusiasm for cherry blossoms to lengths that amaze visitors. 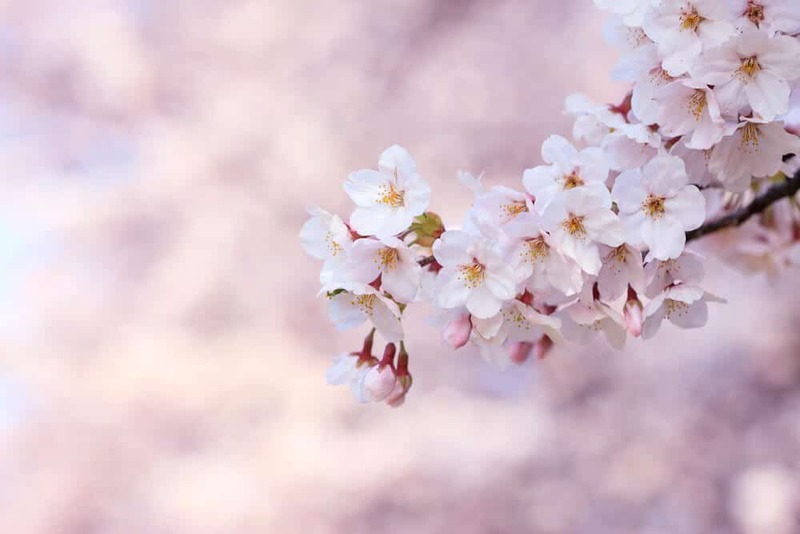 From the beginning of March, Japan cherry blossom forecasts appear on the news. Plans are made to take in the best of the blossoms, and dedicated fans stake out spots beneath the trees hours in advance. The best way to understand Japan’s national obsession is to experience it for yourself. 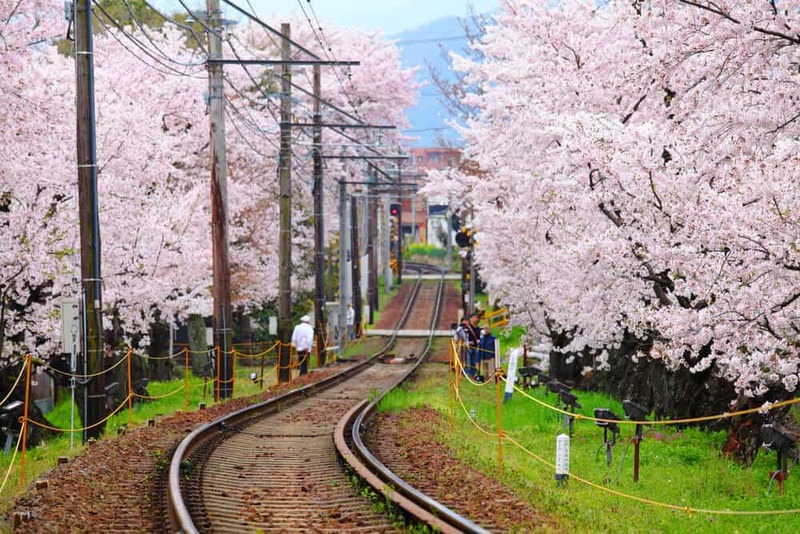 No matter where you are in Japan, you can be sure to find a place to see sakura (cherry blossom) somewhere in your area. If you’re in Tokyo, even better! Tokyo has a wealth of cherry blossom sites to turn even the most doubting tourist into a confirmed hanami (cherry blossom viewing) fan. 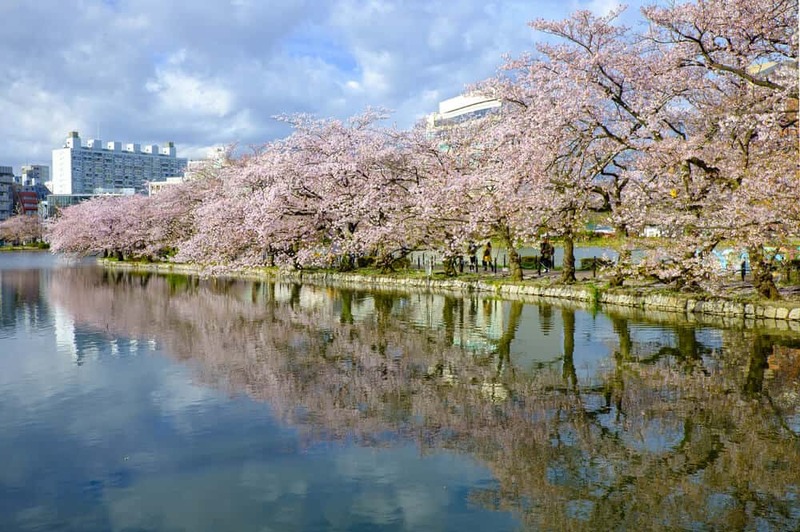 Chidorigafuchi is perhaps the most regal place to view cherry blossoms in Tokyo. More than 260 trees grow either side of the moat surrounding the Imperial Palace. The delicate flowers are in sharp contrast to the stone walls built during the Edo-period. However, the contrast makes the cherry blossoms come alive. It is a reminder of one of the enduring reasons for the popularity of the cherry blossom in Japan. The fleeting nature of the cherry blossom’s beauty led to comparisons with the dangerous lives led by samurai. Just as one strong gust of wind could sweep away all of the cherry blossoms at any moment, the samurai too might be called to battle at any time. Lounging beneath the trees while gazing up at the walls and wooden gates make it easy to imagine life during the samurai era. Chidorigafuchi’s moat has another source of attraction: rental boats. From spring to fall, two-person boats are available to rent and paddle around the moat. During the sakura season, the boats in high demand. People line up for to 4 hours for a chance to rent a boat. If you get there early or don’t mind the long wait, the experience of coasting across the water while cherry blossoms drift past you is a dream-like experience. The view of the cherry blossoms from the water is one of the reasons Chidorigafuchi is such an enduring hanami favorite for Tokyo residents. After your boat ride, you can stroll the 700-meter walkway beside the moat. Chidorigafuchi is a bustling spot, and this can take about an hour. During cherry blossom season, the flowers are lit up from dusk until 22:00 (10:00 pm), and there’s also a festival that takes place. Be aware that there are lots of people and it can get quite loud. To escape the crowds, continue to Kitano Park, or even Yasukuni Shrine. Despite its controversial nature, the memorial for Japan’s fallen soldiers in World War II draws a crowd of visitors daily. There are cherry trees for you to enjoy as well. From March 3-5th 2017, there will be performances of traditional Noh drama taking place at Yasukuni Shrine from 6:40 pm. Call Sunrise Promotions (0570-00-3337) for ticket information. Yes! In fact, Chidorigafuchi may be my favorite of Tokyo’s hanami spots. Sure it’s crowded, but the festive atmosphere combined with the sight of the blossom set against the old stone of the castle walls make Chidorigafuchi special. If you manage to score yourself a boat, that’s a bonus. Chidorigafuchi is a short 10-minute walk from either Hanzomon Station or Kudanshita Station. From Tokyo Station to Kudanshita Station: Take the Tokyo Metro Marunouchi Line towards Ikebukuro. At Otemachi transfer to the Hanzomon Line for Chuo Rinkan. The trip to Kudanshita takes roughly six minutes and costs 170 yen. At Kudanshita Station, take exit #2. Hanzomon Station is the next station after Kudanshita. It takes nine minutes and also costs 170 yen. From Honzomon Station, take exit #5. 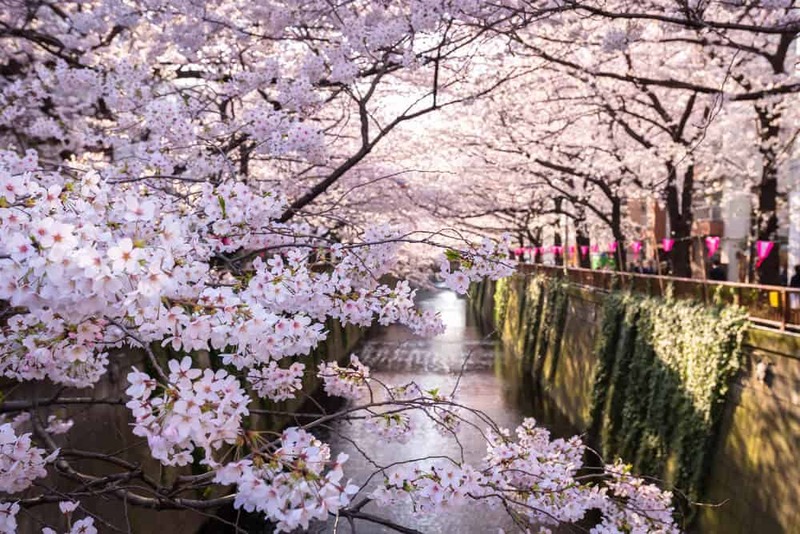 If you want to see cherry blossom by boat but don’t want to wait in life for hours, consider booking a cruise on the Sumida River where cherry blossoms line a few hundred meters of the river. Like Chidorigafuchi, the blossoms are illuminated at night. Meguro River is modern Tokyo’s answer to Chidorigafuchi. 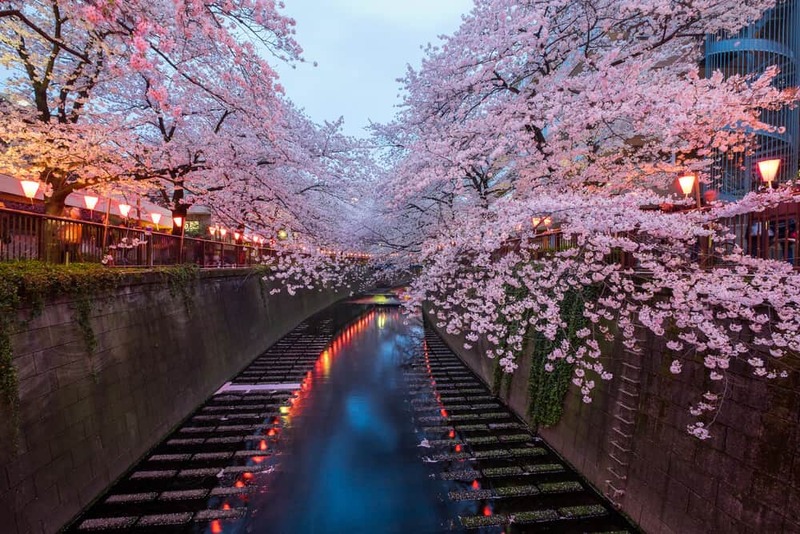 Instead of a historic moat, the 800 cherry trees form a tunnel of blossoms over the steep sides of a concrete canal. The backdrop to the cherry blossoms are not castle walls, but drab office buildings and skyscrapers. It doesn’t sound like much, but somehow the industrial background makes the beauty of the blossoms stand out even more. The cherry blossoms start at Fudomae, near Meguro Station, and continue to Ikejiri Ohashi, near the station of the same name. Meguro district gets whole-heartedly into the cherry blossom season. 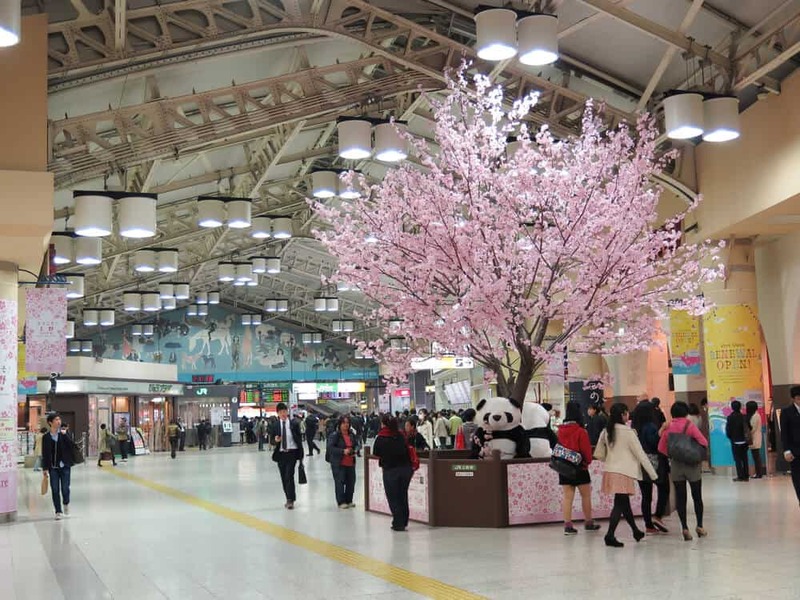 Their cherry blossom festival is lively, attracting crowds to the 3.8 km of sakura-lined walkway beside the canal. The 30thth annual Nakameguro Sakura Festival takes place on April 3rd, with performances from local community groups. On April 2nd and 3rd, there is a Spring Fiesta. On March 25th, “Washu Fes” aims to prove that the best accompaniment to the blossom just starting to make an appearance is Japanese sake. Find out whether you agree by sampling their collection of over one hundred different sake for a flat fee of 3000 yen. Check out their website for more details: Washu Fes (Japanese only). 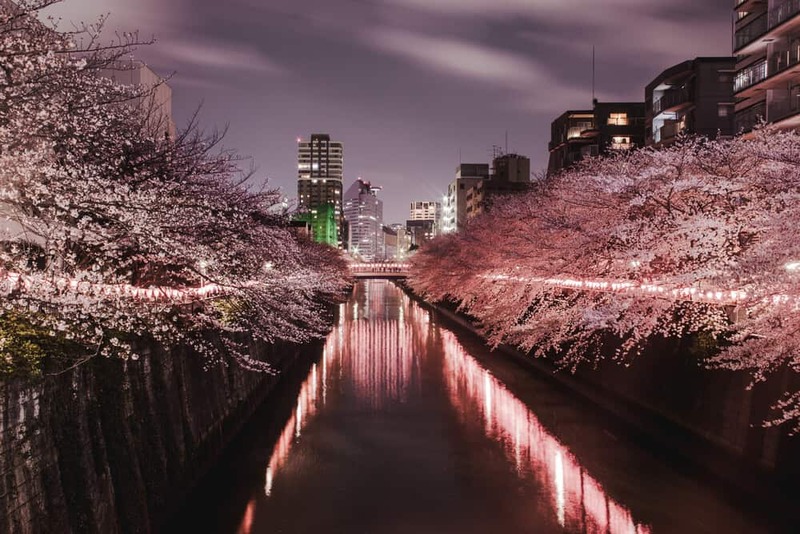 Meguro River’s sakura tunnels are beautiful at day, but at night they’re incredible. The 400,000 LED lights lighting up the blossoms are powered by biodiesel generated from the neighboring households waste products. In between the trees, lanterns hang, adding to the pinkness of the blossoms. At night, the surface of the canal acts as a mirror for the blossom, making for some particularly striking views. Definitely! I enjoy that Meguro River is so different to Chidorigafuchi and yet just as beautiful and enjoyable. The crowds that come to the river are more relaxed, making it is easier to take photos of the blossoms here than at other sakura hot spots. The one downside is that there are few places to sit and nowhere to have a picnic. Start at either Meguro Station or Ikejiri Ohashi Station to do the full walk, or start in the middle at Naka-Meguro Station and do a circuit. It doesn’t really matter—you’ll have a fantastic time either way. Meguro Station: From Tokyo Station, hop on the Yamanote Line towards Osaki. Get off at Meguro Station. It takes about 20 minutes and costs 200 yen. Naka-Meguro Station: Take the Tokyo Metro Marunouchi Line towards Ogikubo. At Kasumigaseki, change to the Hibiya Line for Naka-Meguro. The trip takes a little over 20 minutes and costs 200 yen. Ikejiri Ohashi Station: The trip to Ikejiri Ohashi station is a little more complex. Take the Tokyo Metro Marunouchi Line towards Ikebukuro, changing at Otemachi to the Tokyo Metro Hanzomon Line headed towards Nagatsuta. Get off at Shibuya, and change to the Tokyu Lines, taking the Den-en-Toshi line towards Nagatsuta. Get off at Ikejiri Ohashi. The total trip takes roughly 30 minutes, and costs 330 yen (200 yen for the journey Tokyo-Shibuya, 130 yen for the trip Shibuya-Ikejiri Ohashi). If visiting during the day, the Tokyo Parasitological Museum is nearby and worth adding to your itinerary. Possibly the weirdest museum you’ll ever visit, this two-story free museum includes the world’s longest tapeworm among its exhibits. 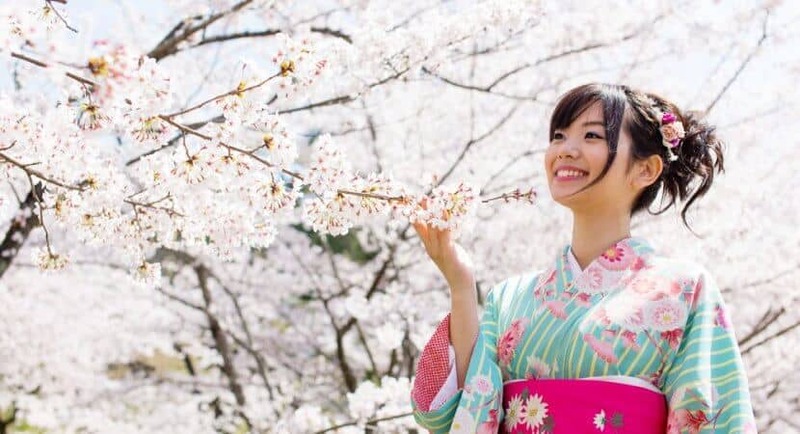 Cherry blossom appreciation isn’t just about viewing the blossoms. A big part of cherry blossom season is picnicking with friends or colleagues below the blossom. 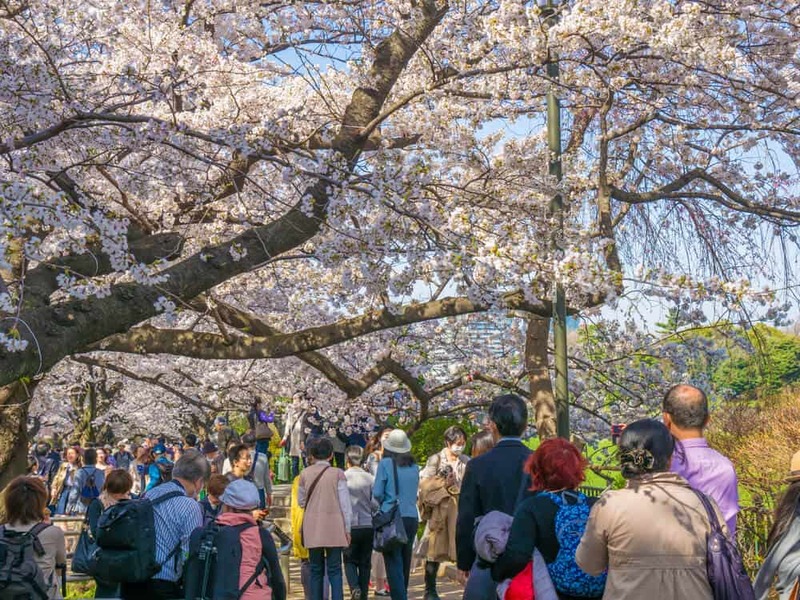 While Chidorigafuchi and Meguro River are primarily places to see blossoms rather than partake in a boozy celebration of them, Ueno Park has blossoms and fun galore. 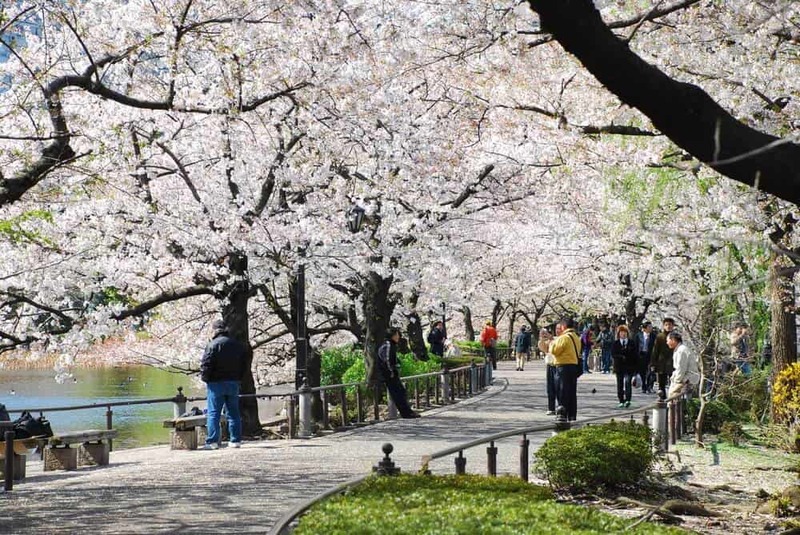 Ueno Park has over 1200 cherry trees in both pink and white varieties. These cherry trees have a history. The head-priest of Kan’ei-ji Temple planted them 400 years ago. During the Edo-period, Kan’ei-ji Temple was the most famous cherry blossom viewing site in Tokyo. Kanei-ji Temple was mostly destroyed when it became the battleground for forces loyal to the shogunate battling those wishing to restore the Imperial family to power. The cherry trees survived and the temple grounds became Ueno Park, one of Japan’s first public parks. Today Ueno Park is the most popular place for hanami in Tokyo. Lining Ueno Park’s main avenue, the blossoms draw several hundred thousand people daily during the cherry blossom season. Not surprisingly, if you want to have a picnic, you have to be prepared for crowded conditions and competition for good spots. Tokyo residents get up early to stake out their spot with ubiquitous blue tarps to sit on. You can purchase your own from any Daiso store. Daiso is a chain of 100 yen shops. While there, you can stock up on other supplies—cheap snacks, disposable plates and cups, and a garbage bag—you’ll have to take your rubbish with you. 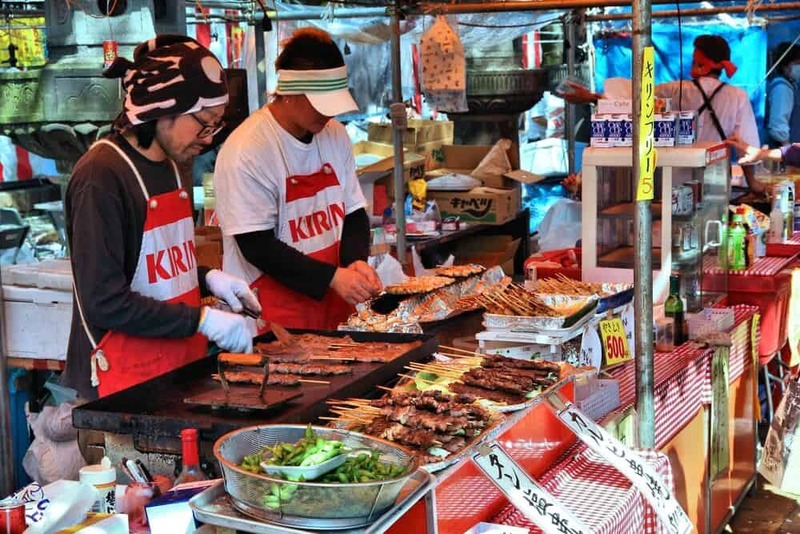 During Ueno Park’s Sakura Festival, a variety of food stalls is set up, offering a variety of festival foods. While the food is delicious, buying a department store bento is more “picnic-y” and is often more economical. Sold in the basement levels of any big department store and many train stations, these bento are so much more than simple Japanese lunch boxes. Seasonal bento, designed for the sakura season, may even feature the delicate flavors of the blossoms themselves in the food. Yes! While the view at either Chidorigafuchi or Meguro River is enjoyable, Ueno Park has the full hanami package. Places to stroll under the trees, places to picnic, and plenty of crowds to watch. 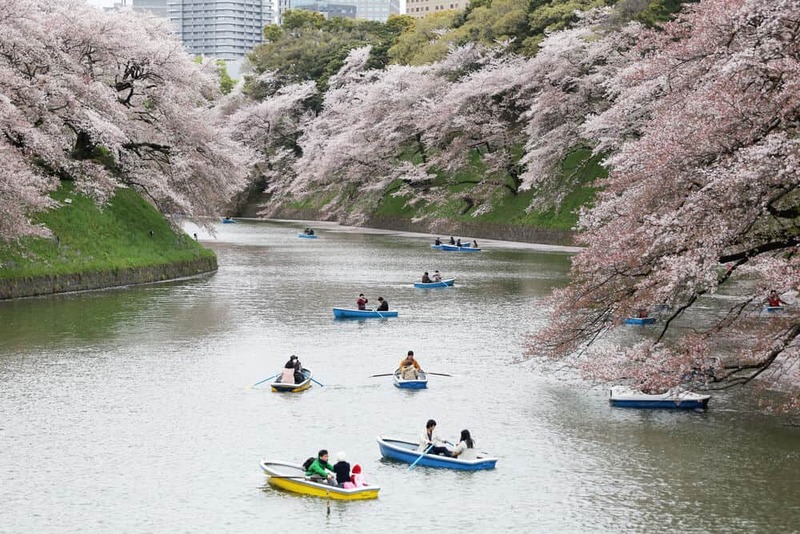 You can even enjoy the blossom from a boat on Shinobazu Pond. The only downsides are the crowds and the lack of illumination. Although Ueno Park is lit at night, the blossoms aren’t as spectacularly lit as the blossoms at Chidorigafuchi and Meguro River. Ueno Park is served by 3 Ueno Stations. The JR Ueno Station, serving the Japan Rail lines, the Tokyo Metro Ueno Station, serving the Ginza and Hibiya lines, and the Keisei Ueno Station, used by the Keisei main line to Narita Airport. From Tokyo Station, take either the Joban line towards Narita or the Utsunomiya line towards Koganei. The trip takes about 6 minutes and costs 160 yen. 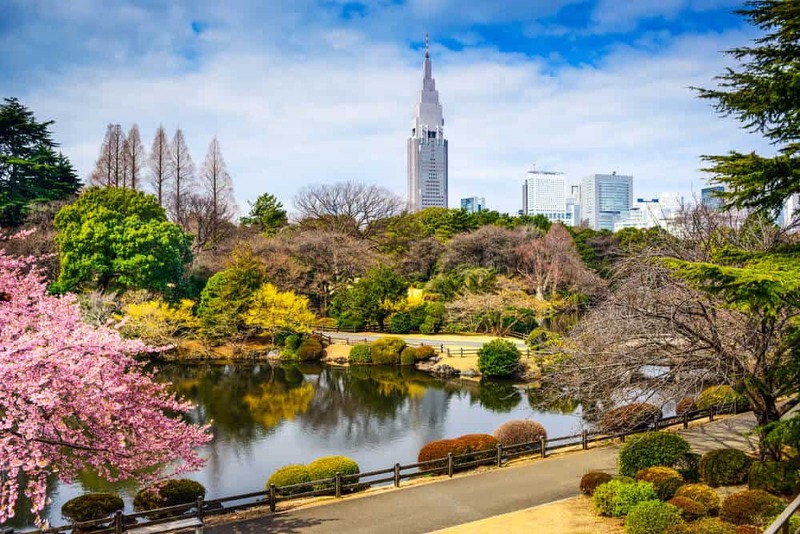 If Ueno Park is too crowded for your taste, but you still want to have a cherry blossom picnic, head to Shinjuku Gyoen. Equally deserving of a mention, Shinjuku Gyoen has 1,000 cherry trees and plenty of space to enjoy them. The catch? All alcohol is prohibited, which is not great for those wanting an “authentic” hanami experience, but does mean there are fewer crowds. This gives you more room to enjoy the cherry blossom at your own pace. 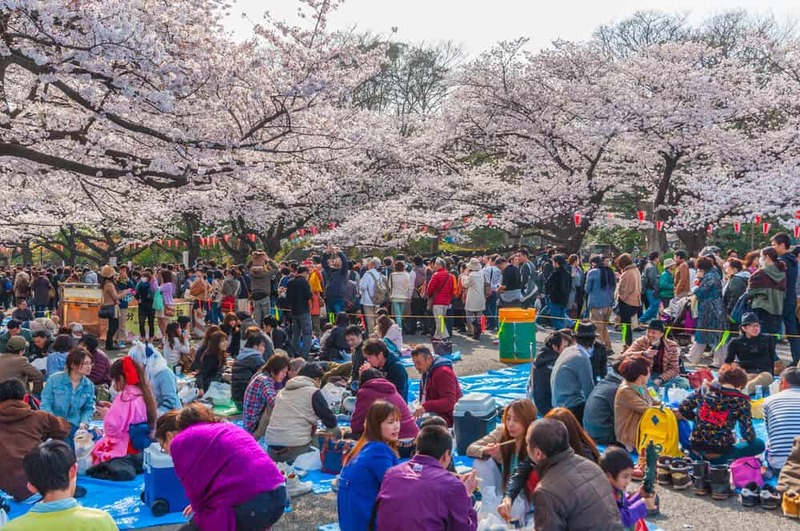 Alternatively, if you arrive early or late to the sakura season, Shinjuku Gyoen has you covered. The park has early and late blossoming varieties of trees, so you have a good chance of seeing the flowers in season. Closed Mondays (if Monday is a national holiday, the following day will be closed) and from December 29th – January 3rd.